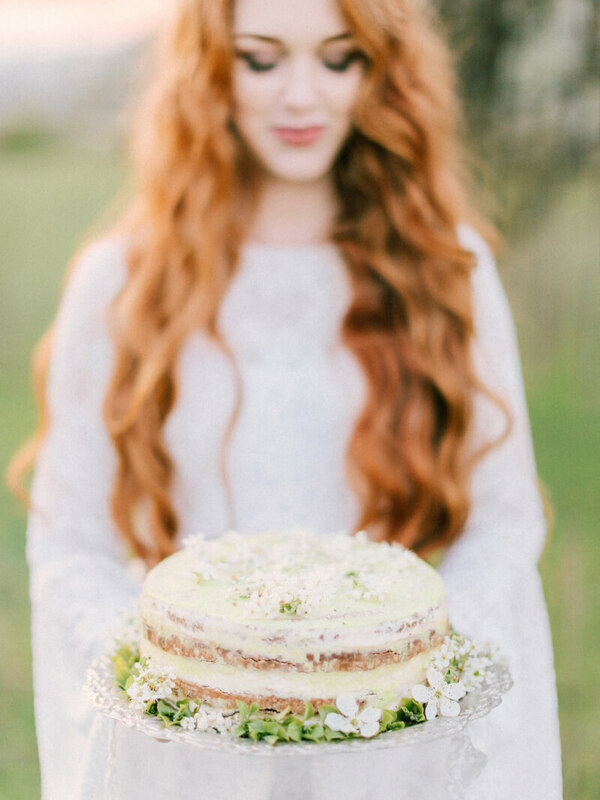 In Crimea, the best time of year for weddings is spring, and this styled shoot highlights why it’s the perfect season to say “I do.” Verdant grass, impressive mountain views and sparse tourists make this outdoor spot in the countryside a dream location for an intimate ceremony – where the focus is on the sweet and simple, the brighter and lighter. The cherry blossoms play a prominent role in this wedding scene, including serving as the central design to the invitation suite. The bride’s bouquet borrows the pink and white color palette of the cherry blossoms and presents a loose collection of white roses, eucalyptus and a single pink rose. 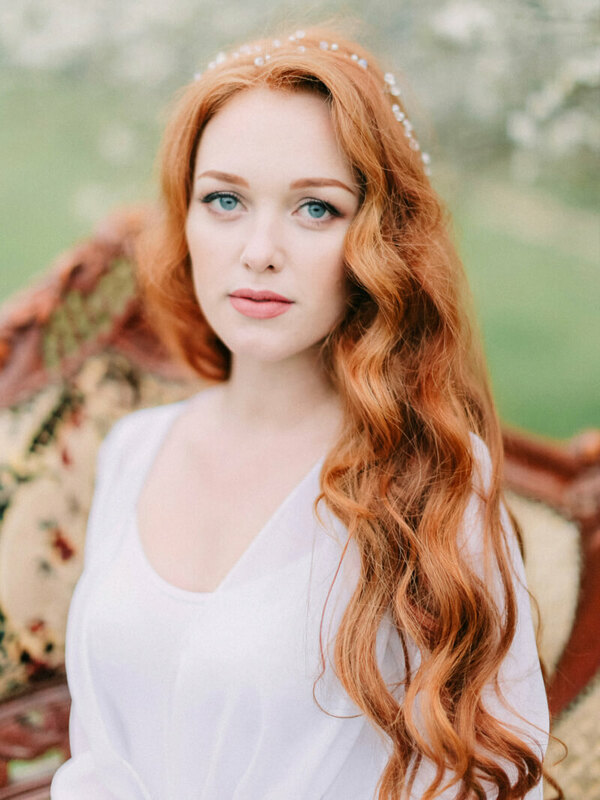 With her fiery red hair and piercing eyes, the bride looks utterly statuesque perched under the expansive cherry blossom trees. She stuns in not one, but two gowns. A billowy long-sleeved creation is dreamy and whimsical, while a lace gown with bell sleeves is romantic and timeless. She pairs each with a dainty and delicate headpiece that adds just the right amount of sparkle. Waiting for his bride, the dashing groom chooses a simple but appropriate dark blue suit with a white shirt and striped tie. They walk in the grass towards the ceremony location set among the cherry blossom trees. Overlooking the mountains in the distance, the two join hands and profess their love to one another. They exchange rings, a hug and some laughs before the groom lifts his bride with an exuberant spirit. The small celebration that follows combines the natural aesthetic of the location with a timeless white color scheme. 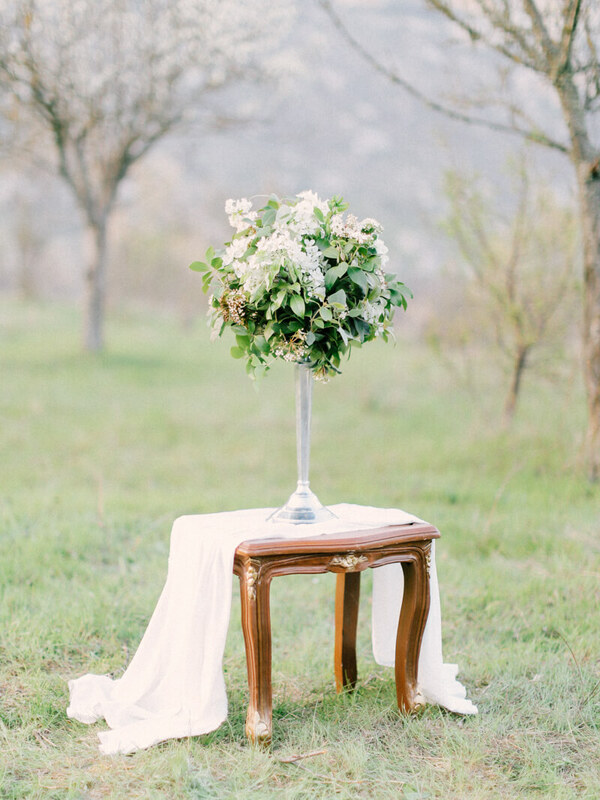 The table is flanked on both sides by wooden reception chairs and is covered with a white runner. Each place setting includes a brilliant collection of green floral-inspired glass plates and matching goblets. Underneath each plate is a personalized napkin. The small gathering is full of charm and laughter as the couple and their guests bask in the early evening sun. The bride presents a modest cake embellished with floral touches, a simple creation that ties in the setting perfectly. 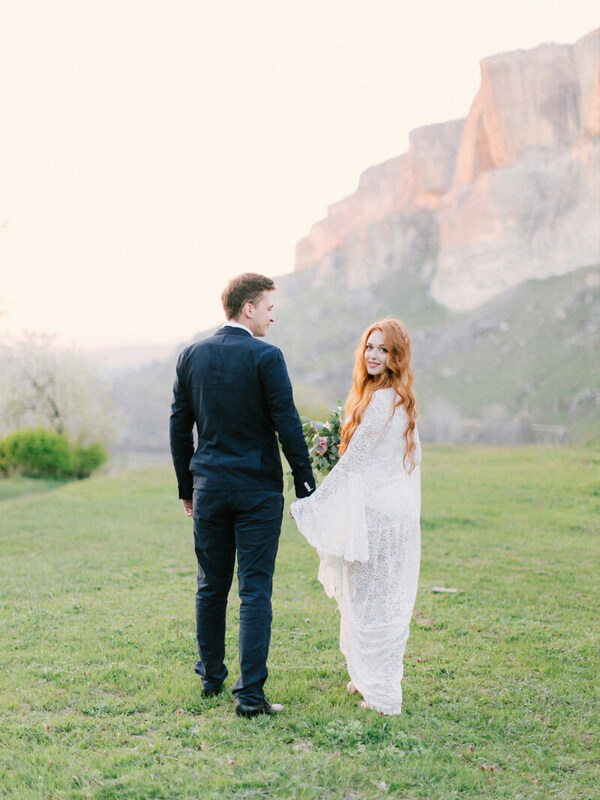 The pastel sky splashes color on the mountains and beckons the couple to enjoy the beautiful countryside with a stroll, a chance to step away from the celebration and step in to their future. 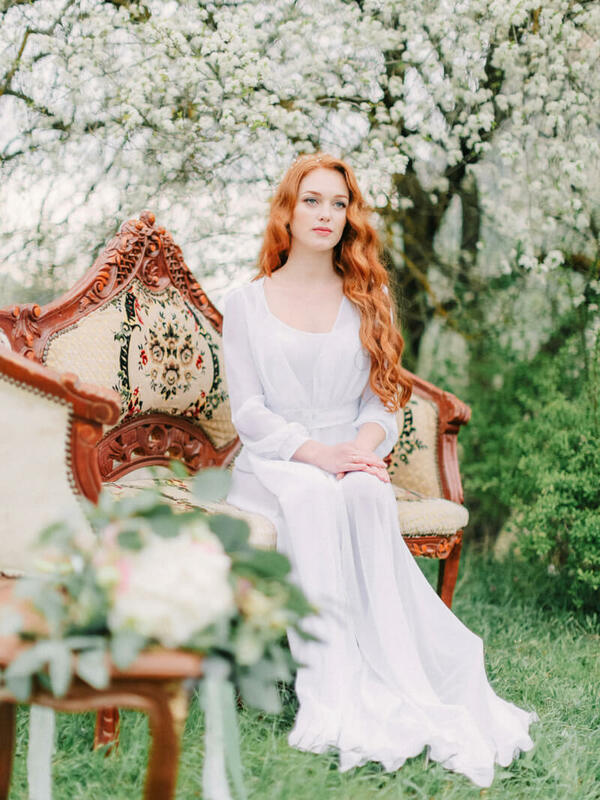 Maybe it’s the cherry blossoms, or the bride’s red hair or the contrast between the soft flowers and the mountains, but this styled shoot from Crimea is a simple, yet powerful scene that showcases the impact of a small, intimate affair. If your wish is to have a small wedding, it’s okay to keep the guest list and décor modest because the natural beauty, the romance and effortless style will be more than you could ever hope for or envision.